How do we choose LED strips for home decoration? Where do you want it to be installed? 1) Do you want it to be hidden from direct view, providing subtle feature lighting to compliment your home design? This is a really effective way to transform the way your home presents, and provides a professional and elegant finishing touch without interfering with the design. Indirect lighting looks fantastic when implemented into bulkheads, pelmets, staircases, as well as under floating cabinets and bench tops. We recommend separating control of a zones' indirect lighting from direct/task lighting such as downlights because it offers the perfect solution for mood lighting. 2) Are you looking for LED strip lighting as a direct/ usable light source? There are some fantastic Linear profile designs which house the LED Strip, meaning that using it as a direct and useable light source can often be a much more attractive and consistent alternative to traditional Downlights, Starlights and Pendants. Plus by selecting high performance LED strip, it will provide you with more than enough illumination for task oriented applications such as kitchen bench tops and other work surfaces. There are various types of LED strip and Linear Profiles available to suit a multitude of applications, whether it needs to be recessed, surface mounted, a hanging pendant, short lengths or continuous runs, there is always a way to add it into your lighting design. For domestic applications we tend to recommend using warm white (2,700k) as it provides a more calming effect than neutral or cool white (4,000k & 5,000k respectively). The performance can range between 2.4 watts/meter to more than 30 watts/meter depending on the amount of light required, and the physical limitations and heat sync capabilities of the Linear Profile. It is always recommended to install LED strip onto an Aluminium surface such as Aluminium profile to ensure that the small amounts of heat generated behind each LED chip is efficiently removed, ensuring the longevity of the strip. Also For long runs of LED strip it is recommended to connect both ends to the power supply to eliminate gradual losses in output. 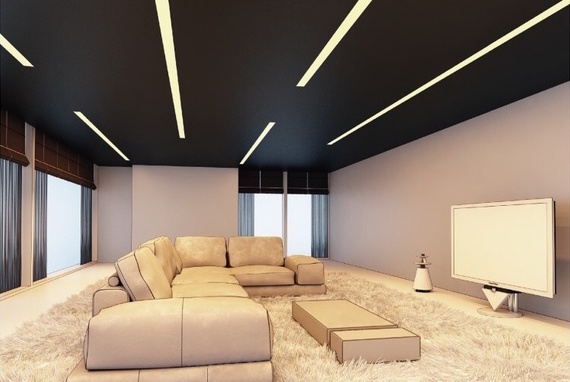 Hope this helps as a brief intro to the various installation options for LED Strip Lighting, it's a really beautiful way to transform the way in which a room is presented, we are using strip lighting more and more in our designs.